The receiver plays at full volume. It won't change. What could be the problem. Do you have to have a remote? Great sound, ample power, nicely styled, well built, good finish quality, excellent documentation, runs cool. FM needs good antenna, no digital outputs, remote somewhat awkward. The Harman Kardon 3475 is the dark-horse, sleeper of the year! Don’t let the price fool you. I bought the HK 3475 as a backup amp to use in the interim while I shopped for my next high-end system. I just wanted something that would amplify a signal enough to energize a speaker. I didn’t expect much for $279. What I got was amazed. It’s one of the best amps I’ve ever heard. And that opinion is well earned because in addition to possessing an absolute passion for music and a highly discriminating ear, I’ve also had the pleasure of hearing some of the finest sound systems made over the past 30 years. You just can’t do much better than this amp at any price. Of course, getting a good sounding Harman Kardon really shouldn’t surprise anybody, after all, they did invent the stereo receiver and have been making them for over fifty years. Knowing that, I guess we should expect nothing less than the best from them. Now for the details…Overall, I would characterize the HK 3475 as comfortably warm. It reminds me of a good baseball glove or a nice pair of jeans after being broken in. It’s has a sound that you can really settle into. The 110 watt/channel, high current, ultra-wide bandwidth design presents a vividly realistic soundstage with awesome clarity and detail, allowing the listener to hear all the subtleties and nuances of every instrument in play even when the volume goes high and the music gets busy. Lows are amply deep, tight and articulate. Mids are clean, well placed and airy. Highs are fully extended, crisp and clear. The harmonic details are presented with pleasing accuracy and good PRAT, which makes the amp both very musical and listenable for long periods of time. Further, the HK 3475 maintains its honesty and realism with any type of music played; be it classical, symphony, country, jazz or rock. The 3475 doesn’t seem to care, it plays them all with equal flair! (no rhyme intended) The receiver has good looks and is well appointed with respect to controls and features. The remote is somewhat unusual; being 8.5”x 2.5” but, it is well organized and has long range for large rooms. Volume control with the remote takes a little getting use to though. It tends to undershoot and overshoot the mark. However, it is consistent and predictable and soon you learn to manipulate it to compensate for this, no problem. The on-unit controls are a little confusing and hard to find at first. They require some practice, even a flashlight in the dark. But, all these minor things are quickly forgotten as you become familiar with the amp and overwhelmed by its sound. The Phono section is outstanding. If you have a good turntable It will make your old records interesting again. The headphones circuitry is equally nice, allowing you to fully appreciate good quality cans. The HK 3475 has an interesting feature called VMAx, which provides a surround sound emulation. While this feature is not preferred for music, it works well with movies, especially when 4 speakers are setup in HT configuration. It also takes some acclimation. This receiver’s sound compares favorably with a number of high-end systems costing thousands. In fact, I bought it after auditioning an Odyssey Stratos/Tempest system and honestly preferred the HK’s sound overall. I found the 3475 more accurate, more real and just plain more fun to listen to. If you’re an audiophile, this is a must have backup amp if your main system is down or you find yourself between rigs. Trust me, you won’t miss your high end gear that much, if at all (especially if it’s an Odyssey Stratos/Tempest). When I first got the HK 3475, I thought that maybe I had just been fortunate to get one right at the top of all its critical tolerances because, after all, they all can’t sound like this for $300, can they? I really don’t know, I’ve never heard another one to be able to say for sure. All I can tell you is that mine sounds absolutely grand and from the other reviews here, it seems like a commonly shared opinion. But don’t just go by the reviews, you have to hear one for yourself in your own listening room and decide. Everybody’s ears and tastes are different- not to mention setup, room conditions, etc. To get the most out of the HK 3475, let it break in for a few days, use good quality input devices, speakers and interconnects. Also, as with most amps, give it about an hour to warm up to peak after being turned on. I’ve heard that a power conditioner makes it even better, but I haven’t tried one yet. Odyssey, Krell, B&K, Pioneer, Marantz, Yamaha, etc., to name a few over 30 years. Solid Bass, Clean and Clear Highs. It is a good looking receiver. This is the best receiver I've ever owned. The bass is pretty clean and solid. The highs are clean and very clear. The remote is decent. I run a pair of cerwin vega Re 30's which contain 12" woofers and I have never had to go more than half way on the volume for any occassion. The V-Max is pretty good for movies, but it can get pretty ugly on some music. You really don't need to use V-Max on music anyways, this receiver does better than most in stereo mode. Overall it is well worth $300 bucks. Mostly kenwood and other midgrade equipment. Build. Simplicity. Sonic image (Neutral). Lots of clean power! for only 75 watts! Doesn't get hot. No optical cable inputs. Low hum when powered, probably from my 220-110 transformer. I recently bought a home theatre (HT) system, a self-gratification for acquiring recently my Bachelor’s in Computer Science. In all I did quite well because I opted for this instead of a Harley. Needless to say, something was still missing, even thought my HT was complete. It didn’t lend itself well physically to the enjoyment of my records. I probably want the turntable around the HT. 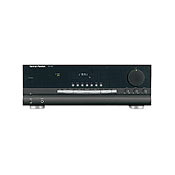 So I was back to audioreview.com trying find a low cost receiver that would do well with my phonograph. Within a few weeks I settled on the HK 3375 based on the 3475 reviews as well as others from google.com When the unit arrived I marveled at its beauty, it is quite a looker. I was quickly disappointed by a nasty hum that resonated when powered. After changing transformers I found that this problem was not, luckily related to the receiver. Later I study its musicality, first with a pair of Axiom mt3i bookshelf’s, which did not, impressed me. I must admit I have been spoiled these last few months by my Denon AV 1803 and Bose 601. These two really bring the Opera to my saloon. I read that the HK’s are neutral in color and this must be true because the imaging was a little flat with my, much-loved Axioms. So I connected the HK to my Bose and wow, I believe they’re a good match. My 601’s are a bit bright and combined with the HK’s neutrality they seem to image much like my Axioms do with the Denon. The effect they produced is very near sound stage, which is unlike my Denon and Bose combination that when together produce wonderfully, and with amazing depth my opera’s, and symphonies. This for me is acceptable since the intent is to use this setup to play my 80’s collection of records, which the HK does do nicely. The highs are crisp; mids are clear and the lows tight. This one aspect did surprise me since my Bose are normally a bit soft in base, much like live symphonies. I have read quite a few reviews during the course of several months, and have found that placement is important, but not the only factor. The combination of speaker and amps is probably a more important a concern to the audiophile since the same speaker with different amps will likely produce varying sonic images. Another point of note is the environment. Case in point I live in a villa made of Italian tufa stone that is 18 inches thick. The music room is 18 by 30 feet long and has a twelve-foot height. Naturally the sound produced here will be quite different from those produced in a wooden home with thin sheet rock walls. So feel free to experiment. These variables here mentioned, I believe are in large part responsible for such widely different opinions to audio equipment. In any event I’m quite happy with the purchase. This unit is simple has easy to navigate buttons. Unfortunately it does not have optical inputs. I’m a big fan of such because the transfer of digital data is pure and not subject to lose as with inferior metal cables. The build is strong with a nice heft. It has an uncluttered array of option in the rear unlike my Denon, which is complicated. The remote is nice simple and solid. This receiver is great. It offers lively, clear, and dynamic sound at a reasonable price. Perfect for all types of music.